(By Bob McCurdy) As a manager, it is important to search for different ways to make the same point to a sales staff so that they don’t begin to tune out your message. The same holds true for a salesperson who is attempting to communicate a critical point to a client. It’s always more effective to be able to make the case for your POV using new and fresh data/information than just pounding away with the same information, presented in a similar fashion. It’s for this reason I am constantly on the lookout for new articles, information, and data that enables me to communicate my POV in novel ways that support my marketing recommendations. Last week I received some outstanding information from Nielsen that should enable us to elevate our case for radio’s inclusion in a media mix. 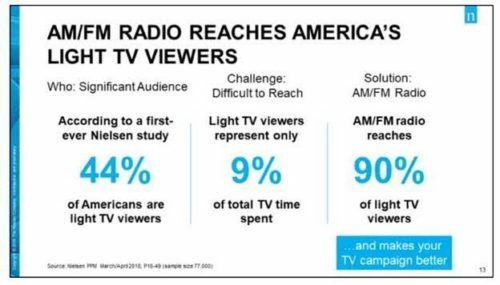 Nielsen presented these powerful slides during their “Audio Supercharges TV Campaigns” presentation at their Consumer360 event in Washington, DC, recently. We all should be familiar with them and, where applicable, share/discuss them with our clients. I’ve often written about the fact that no single medium can effectively “do it all.” The Nielsen slide below provides us with more ammunition to make this point with fresh data. Note the title of the slide and note the author of the slide — a company that has served as the gold standard in audience research for decades. The data is from an analysis of an automotive TV campaign which aired close to 3,000 TV commercials. The results again highlight the fact that even the heaviest of TV campaigns can’t reach everyone, missing almost 1 out of 4 25-54 adults and 4 out of 10 18-34 adults. These figures should be at least directionally applicable to most local TV campaigns. I’ve often made the point about TV having heavy and light viewers. Nielsen’s slide below provides new data/insights regarding the sizeable portion of the population who are light TV viewers and the amount of time they spend with TV. According to a first-ever Nielsen study, 44% of Americans are light TV viewers, representing only 9% of total TV viewing. Paraphrased, 44% of TV viewers will likely be exposed to only about 9% of all TV commercials. What are the chances of effectively reaching these viewers effectively? Does it make any economic sense to use a medium to reach its light users? A key power point from this slide — radio reaches 9 out of 10 light TV viewers. The light users of any medium tend to be heavier users of another medium. Nielsen’s Scarborough has continually shown this to be the case. I pulled the chart below last week for a heavy TV client in Detroit which supports the data from the chart above. Close to 40% (39.5%) of A18+ in Detroit account for only 6% of all TV viewing. TV alone effectively misses 40% of all potential customers, yet these viewers listen to radio close to 2 hours daily. Unlike a bottle of milk, research studies typically don’t have an expiration data. Studies that were conducted a year, two, or three back are still valid and admissible (as the slides above confirm) as long as they don’t relate to any individual media channel’s audience but instead focus on the manner in which the media are used. So here is an “oldie” from 2016 that might have slipped your mind. The Advertising Research Foundation in 2016, in their “How Advertising Works, Today” study concluded that radio, when added to a TV-only campaign, boosts the return-on-investment +20%. Not bad. There’s data and research coming out every day in the trades that can assist us in making our case for our medium and our marketing POV. It’s a good idea for all of us to keep our eyes peeled for that information, keep it where it can be repurposed and get to know the Nielsen rep. They can provide us with a ton of powerful information and insights. Next articleMost Effective Marketing is Free!